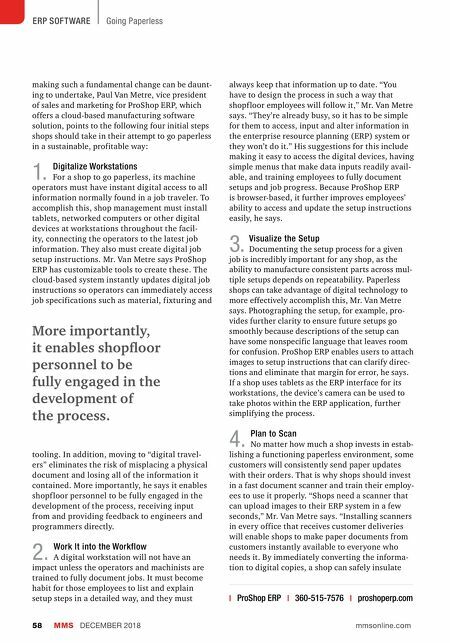 MMS DECEMBER 2018 58 mmsonline.com ERP SOFTWARE Going Paperless making such a fundamental change can be daunt- ing to undertake, Paul Van Metre, vice president of sales and marketing for ProShop ERP, which offers a cloud-based manufacturing software solution, points to the following four initial steps shops should take in their attempt to go paperless in a sustainable, profitable way: 1. Digitalize Workstations For a shop to go paperless, its machine operators must have instant digital access to all information normally found in a job traveler. To accomplish this, shop management must install tablets, networked computers or other digital devices at workstations throughout the facil- ity, connecting the operators to the latest job information. They also must create digital job setup instructions. Mr. Van Metre says ProShop ERP has customizable tools to create these. The cloud-based system instantly updates digital job instructions so operators can immediately access job specifications such as material, fixturing and tooling. In addition, moving to "digital travel- ers" eliminates the risk of misplacing a physical document and losing all of the information it contained. More importantly, he says it enables shopf loor personnel to be fully engaged in the development of the process, receiving input from and providing feedback to engineers and programmers directly. 2. Work It into the Workflow A digital workstation will not have an impact unless the operators and machinists are trained to fully document jobs. It must become habit for those employees to list and explain setup steps in a detailed way, and they must | ProShop ERP | 360-515-7576 | proshoperp.com always keep that information up to date. "You have to design the process in such a way that shopf loor employees will follow it," Mr. Van Metre says. "They're already busy, so it has to be simple for them to access, input and alter information in the enterprise resource planning (ERP) system or they won't do it." His suggestions for this include making it easy to access the digital devices, having simple menus that make data inputs readily avail- able, and training employees to fully document setups and job progress. Because ProShop ERP is browser-based, it further improves employees' ability to access and update the setup instructions easily, he says. 3. 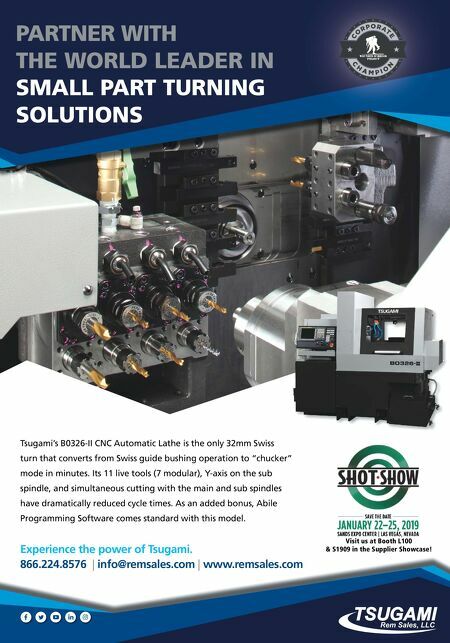 Visualize the Setup Documenting the setup process for a given job is incredibly important for any shop, as the ability to manufacture consistent parts across mul- tiple setups depends on repeatability. Paperless shops can take advantage of digital technology to more effectively accomplish this, Mr. Van Metre says. Photographing the setup, for example, pro- vides further clarity to ensure future setups go smoothly because descriptions of the setup can have some nonspecific language that leaves room for confusion. ProShop ERP enables users to attach images to setup instructions that can clarify direc- tions and eliminate that margin for error, he says. If a shop uses tablets as the ERP interface for its workstations, the device's camera can be used to take photos within the ERP application, further simplifying the process. 4. Plan to Scan No matter how much a shop invests in estab- lishing a functioning paperless environment, some customers will consistently send paper updates with their orders. That is why shops should invest in a fast document scanner and train their employ- ees to use it properly. "Shops need a scanner that can upload images to their ERP system in a few seconds," Mr. Van Metre says. "Installing scanners in every office that receives customer deliveries will enable shops to make paper documents from customers instantly available to everyone who needs it. By immediately converting the informa- tion to digital copies, a shop can safely insulate More importantly, it enables shopfloor personnel to be fully engaged in the development of the process.